Vinegar is a liquid consisting mainly of acetic acid (CH3COOH) and water. The acetic acid is produced by the fermentation of ethanol by acetic acid bacteria. Vinegar is now mainly used as a cooking ingredient, but historically, as the most easily available mild acid, it had a great variety of industrial, medical, and domestic uses, some of which (such as a general household cleanser) are still promoted today. Commercial vinegar is produced either by fast or slow fermentation processes. In general, slow methods are used with traditional vinegars, and fermentation proceeds slowly over the course of months or a year. The longer fermentation period allows for the accumulation of a nontoxic slime composed of acetic acid bacteria. Fast methods add mother of vinegar (i.e., bacterial culture) to the source liquid before adding air using a venturi pump system or a turbine to promote oxygenation to obtain the fastest fermentation. In fast production processes, vinegar may be produced in a period ranging from 20 hours to three days. Apple cider vinegar is made from cider or apple must, and has a brownish-gold color. It is often sold unfiltered and unpasteurized with the mother of vinegar present, as a natural product. Because of its acidity, apple cider vinegar may be very harsh, even burning, to the throat. If taken straight (as opposed to used in cooking), it can be diluted (e.g., with fruit juice or water) before drinking. It is also sometimes sweetened with sugar or honey. The pH of apple cider vinegar is typically between pH 4.25 and 5.00 if undiluted. Balsamic vinegar is an aromatic, aged type of vinegar traditionally produced in the Modena and Reggio Emilia provinces of Italy from the concentrated juice, or must, of white grapes (typically of the Trebbiano variety). It is very dark brown in color, and its flavor is rich, sweet, and complex, with the finest grades being the product of years of aging in a successive number of casks made of various types of wood (including oak, mulberry, chestnut, cherry, juniper, ash, and acacia). Originally a product available to only the Italian upper classes, a cheaper form of balsamic vinegar became widely known and available around the world in the late 20th century. True balsamic vinegar (which has Protected Designation of Origin status) is aged for 12 to 25 years. Balsamic vinegars that have been aged for up to 100 years are available, though they are usually very expensive. The commercial balsamic sold in supermarkets is typically made with concentrated grape juice mixed with a strong vinegar, which is laced with caramel and sugar. Regardless of how it is produced, balsamic vinegar must be made from a grape product. Balsamic vinegar has a high acidity level, but the tart flavor is usually hidden by the sweetness of the other ingredients, making it very mellow. Vinegar made from beer is produced in the United Kingdom, Germany, Austria, and the Netherlands. Although its flavor depends on the particular type of beer from which it is made, it is often described as having a malty taste. That produced in Bavaria is a light golden color with a very sharp and not-overly-complex flavor. 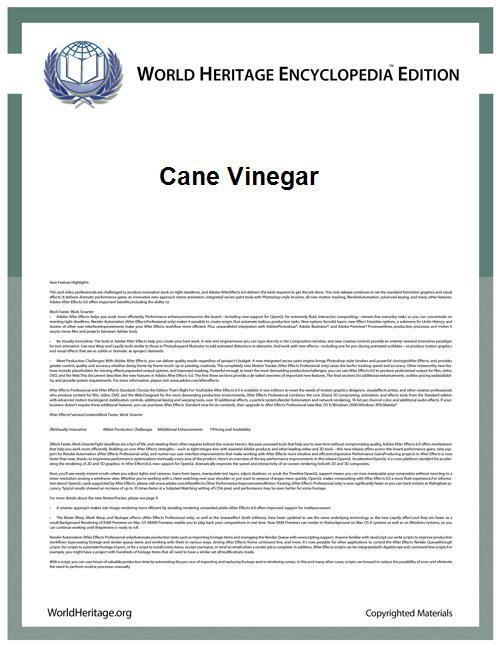 Cane vinegar, made from sugarcane juice, is most popular in the Philippines, in particular, the Ilocos Region of the northern Philippines (where it is called sukang iloko), although it also is produced in France and the United States. It ranges from dark yellow to golden brown in color, and has a mellow flavor, similar in some respects to rice vinegar, though with a somewhat "fresher" taste. Because it contains no residual sugar, it is no sweeter than any other vinegar. In the Philippines, it often is labeled as sukang maasim (Tagalog for "sour vinegar"). Cane vinegars from Ilocos are made in two different ways. One way is to simply place sugar cane juice in large jars and it will directly become sour by the direct action of bacteria on the sugar. The other way is through fermentation to produce a local wine known as 'basi'. Low quality 'basi' is then allowed to undergo acetic acid fermentation that converts alcohol into acetic acid. Contaminated 'basi' also become vinegar. Coconut vinegar, made from fermented coconut water, is used extensively in Southeast Asian cuisine (particularly in the Philippines and Sri Lanka, major producers, where it is called suka ng niyog or vinakiri), as well as in some cuisines of India, especially Goan cuisine. A cloudy white liquid, it has a particularly sharp, acidic taste with a slightly yeasty note. The term "distilled vinegar" is something of a misnomer, because it is not produced by the distillation of vinegar, but rather, by the fermentation of distilled alcohol. The fermentate is then diluted to produce a colorless solution of about 5% to 8% acetic acid in water, with a pH of about 2.4. This is variously known as distilled spirit or "virgin" vinegar, or white vinegar, and is used for medicinal, laboratory, and cleaning purposes, as well as in cooking, baking, meat preservation, and pickling. The most common starting material in some regions, because of its low cost, is malt. In the United States, corn (maize) is the usual starting ingredient for most distilled vinegars, such as the Heinz brand. Chinese black vinegar is an aged product made from rice, wheat, millet, sorghum, or a combination thereof. It has an inky black color and a complex, malty flavor. There is no fixed recipe, so some Chinese black vinegars may contain added sugar, spices, or caramel color. The most popular variety, Zhenjiang vinegar, originates in the city of Zhenjiang in Jiangsu Province, eastern China. Shanxi aged vinegar (山西老陈醋) is another popular type of Chinese vinegar that is made exclusively from sorghum. A somewhat lighter form of black vinegar, made from rice, is produced in Japan, where it is called kurozu. Since 2004, it has been marketed as a healthful drink; its manufacturers claim it contains high concentrations of amino acids. Recent research on kurozu has revealed its anticancer properties in vivo on rats and in vitro on human cancer cells. Herb vinegars are flavored with herbs, most commonly Mediterranean herbs, such as thyme, tarragon or oregano. Such vinegars can be prepared at home by adding sprigs of fresh or dried herbs to vinegar purchased at a grocery store; generally a light-colored, mild tasting vinegar, such as that made from white wine, is used for this purpose. Vinegar may also be flavoured with spices. Malt vinegar infused with whole chillies is often provided at British seafood stalls. Sweetened vinegar is of Cantonese origin, and is made from rice wine, sugar and herbs, including ginger, cloves, and other spices. Fruit vinegars are made from fruit wines, usually without any additional flavoring. Common flavors of fruit vinegar include apple, blackcurrant, raspberry, quince, and tomato. Typically, the flavors of the original fruits remain in the final product. Most fruit vinegars are produced in Europe, where there is a growing market for high-price vinegars made solely from specific fruits (as opposed to nonfruit vinegars that are infused with fruits or fruit flavors). Several varieties, however, also are produced in Asia. Persimmon vinegar, called gam sikcho (감식초), is popular in South Korea. Jujube vinegar, called zaocu or hongzaocu (simplified Chinese: 枣醋 / 红枣醋; traditional Chinese: 棗醋 / 紅棗醋), and wolfberry vinegar, called gouqicu (Chinese: 枸杞醋), are produced in China. Jamun sirka (Hindi: जामुन सिरका), a vinegar produced from the jamun (or rose apple) fruit in India, is considered to be medicinally valuable for stomach, spleen and diabetic ailments. Vinegar made from honey is rare, although commercially available honey vinegars are produced in Italy, France, Romania and Spain. In Japan, an aged vinegar also is made from Job's tears, a tall, grain-bearing, tropical plant. The vinegar is similar in flavor to rice vinegar. A byproduct of commercial kiwifruit growing is a large amount of waste in the form of, first, misshapen or otherwise-rejected fruit that may constitute up to 30 percent of the crop and, second, kiwifruit pomace, which is the presscake residue left after kiwifruit juice manufacture. One of the uses for this waste is the production of kiwifruit vinegar, produced commercially in New Zealand since, at least, the early 1990s, and in China in 2008. Kombucha vinegar is made from kombucha, a symbiotic culture of yeast and bacteria. The bacteria produce a complex array of nutrients and populate the vinegar with bacteria that some claim promote a healthy digestive tract, although no scientific studies have confirmed this. Kombucha vinegar primarily is used to make a vinaigrette, and is flavored by adding strawberries, blackberries, mint, or blueberries at the beginning of fermentation. Palm vinegar, made from the fermented sap from flower clusters of the nipa palm (also called attap palm), is used most often in the Philippines, where it is produced, and where it is called sukang paombong. Its pH is between five and six. Vinegar made from raisins, called khall ʻinab (Arabic: خل عنب‎ "grape vinegar") is used in cuisines of the Middle East, and is produced there. It is cloudy and medium brown in color, with a mild flavor. Rice vinegar (Chinese:米醋）is most popular in the cuisines of East and Southeast Asia. It is available in "white" (light yellow), red, and black varieties. The Japanese prefer a light rice vinegar for the preparation of sushi rice and salad dressings. Red rice vinegar traditionally is colored with red yeast rice. Black rice vinegar (made with black glutinous rice) is most popular in China, and it is also widely used in other East Asian countries. White rice vinegar has a mild acidity with a somewhat "flat" and uncomplex flavor. Some varieties of rice vinegar are sweetened or otherwise seasoned with spices or other added flavorings. A variation of cane or coconut vinegar from the Philippines is called sinamak, which is simply a spiced version that mixes the cane or coconut vinegar with siling labuyo, onions, and garlic. The term 'spirit vinegar' is sometimes reserved for the stronger variety (5% to 20% acetic acid) made from sugar cane or from chemically produced acetic acid. Production of Sherry vinegar is linked to the production of wines of Jerez. The vinegar is made exclusively from the acetic fermentation of Sherry wines; the taste of this vinegar is stronger than that of wine. The resulting color of this vinegar is dark-mahogany; it is concentrated and has generous aromas; the nose will notice the hue of wood. Sherry vinegar is ideal for vinaigrettes and salad dressings and for flavoring various foods. There is evidence of its existence back in the first century AD, in the writings of Cadiz wiseman Columella. It is currently presented with quality products certified by the government of Andalusia and its production is regulated by the Consejo Regular del Vino y Brandy de Jerez (Council regulating the production of Jerez wine and brandy). Two types are found: Vinagre de Jerez, which is aged for six months or Vinagre de Jerez Reserva, which is aged for a minimum of two years (although the Council allows to specify the age if this is greater, and vinegar 20 or 30 years old can be found). Wine vinegar is made from red or white wine, and is the most commonly used vinegar in Southern and Central Europe. As with wine, there is a considerable range in quality. Better-quality wine vinegars are matured in wood for up to two years, and exhibit a complex, mellow flavor. Wine vinegar tends to have a lower acidity than white or cider vinegars. More expensive wine vinegars are made from individual varieties of wine, such as Champagne, sherry, or Pinot gris. Vinegar is commonly used in food preparation, in particular in pickling processes, vinaigrettes, and other salad dressings. It is an ingredient in sauces such as mustard, ketchup, and mayonnaise. Vinegar is sometimes used while making chutneys. It is often used as a condiment. Marinades often contain vinegar. In terms of its shelf life, vinegar's acidic nature allows it to last indefinitely without the use of refrigeration. Condiment for fish and chips — in Britain, Ireland, Canada and Australia, salt and malt vinegar (or non-brewed condiment) is sprinkled on chips. In Canada, white vinegar is often used. Flavoring for potato chips — many American, Canadian, British and Australian manufacturers of packaged potato chips and crisps feature a variety flavored with vinegar and salt. Vinegar pie — a North American variant on the dessert called chess pie. It is flavored with a small amount of cider vinegar and some versions also contain raisins, spices and sour cream. Pickling — any vinegar can be used to pickle foods. Cider vinegar and sauces — cider vinegar usually is not suitable for use in delicate sauces. Apple cider vinegar — Usually placed on the table in small bowls or cups so that people can dip their crab meat into it. Also mixed with water and used to steam crabs. Substitute for fresh lemon juice — cider vinegar can usually be substituted for fresh lemon juice in recipes and obtain a pleasing effect although it lacks the vitamin C.
Saucing roast lamb — pouring cider vinegar over the meat when roasting lamb, especially when combined with honey or when sliced onions have been added to the roasting pan, produces a sauce. Sweetened vinegar is used in the dish of pork knuckles and ginger stew, which is made among Chinese people of Cantonese backgrounds to celebrate the arrival of a new child. Sushi rice — Japanese use rice vinegar as an essential ingredient for sushi rice. Flavoring — used in the Southern U.S. to flavor collard greens, green beans, black-eyed peas, or cabbage to taste. Commonly put into mint sauce, for general palate preference. Vinegar — especially the coconut, cane, or palm variety — is one of the principal ingredients of Philippine cuisine. Several beverages are made using vinegar, for instance Posca. Other preparations range from simply mixing sugar water or honey water with small amounts of fruity vinegar to making syrup by laying fruit or mint in vinegar essence for several days, then sieving off solid parts, and adding considerable amounts of sugar. Some prefer to also boil the result as a final step. These recipes have lost much of their popularity with the rise of carbonated beverages, such as soft drinks. Many remedies and treatments have been ascribed to vinegar over millennia and in many different cultures; however, few have been verifiable using controlled medical trials and many that are effective to some degree have significant side-effects and carry the possibility of serious health risks. A 2006 study concluded that a test group of rats fed with acetic acid (the main component of vinegar) had "significantly lower values for serum total cholesterol and triacylglycerol" and other health benefits. Rats fed vinegar or acetic acid have lower blood pressure than controls, although the effect has not been tested in humans. Reduced risk of fatal ischemic heart disease was observed among participants in a trial who ate vinegar and oil salad dressings frequently. Prior to hypoglycemic agents, diabetics used vinegar teas to control their symptoms. Small amounts of vinegar (approximately 25 g of domestic vinegar) added to food, or taken along with a meal, have been shown by a number of medical trials to reduce the glycemic index of carbohydrate food for people with and without diabetes. This also has been expressed as lower glycemic index ratings in the region of 30%. Multiple trials indicate that taking vinegar with food increases satiety (the feeling of fullness) and, so, reduces the amount of food consumed. Daily intake of 15 mL of vinegar (750 mg acetic acid) might be useful in the prevention of metabolic syndrome by reducing obesity. Vinegar was thought to be useful for treating infections in ancient times. Hippocrates (460–377 BC) prescribed it for curing pleurisy, fever, ulcers, and constipation; it was used by the ancient Egyptians to kill bacteria. When combined with honey to create oxymel, it was a common cough medicine in the ancient world. Vinegar also had multiple uses in ancient Babylon, where it was made from wine beginning around 5000 BC. The Babylonians used vinegar to preserve food and as a component of medicines. Researchers at the Food Biotechnology Department, Instituto de la Grasa (CSIC) in Seville, Spain conducted research on the antimicrobial activity of several food products, including vinegar. The following microorganisms were used in the study: S. aureus, L. monocytogenes, S. Enteritidis, E.coli 0157:H7, S. sonnei, and Yersinia sp. Vinegar (5% acetic acid) showed bactericidal activity against all strains tested, which was attributed to its acidity. The phenolic composition analysis of vinegar shows the presence of gallic acid, 4-hydroxybenzaldehyde, catechin, vanillic acid, caffeic acid, syringic acid, vanillin, syringaldehyde, p-coumaric acid, m-coumaric acid, anisaldehyde, epicatechin, sinapic acid, salicylaldehyde, scopoletin, veratraldehyde and o-coumaric acid. See cleaning uses for further references regarding antimicrobial use. Applying vinegar to common jellyfish stings deactivates the nematocysts; however, placing the affected areas in hot water is a more effective treatment because the venom is deactivated by heat. The latter requires immersion in 45 °C (113 °F) water for at least four minutes for the pain to be reduced to less than what would be accomplished using vinegar. But vinegar should not be applied to Portuguese man o' war stings, however, since they are not actually jellyfish and vinegar can cause their nematocysts to discharge venom, making the pain worse. Vinegar is often used as a natural deodorant, mainly because of its antibacterial effect. [unreliable source?] Diluted vinegar can also be used as a hair conditioner and detangler by pouring over wet hair and rinsing. No vinegar smell remains after hair has been rinsed and dried. Vinegar has been shown ineffective for use against lice but (combined with 60% Salicylic acid) significantly more effective than placebo for the treatment of warts. Contrary to popular belief, vinegar cannot be used as a detoxification agent to circumvent urinalysis testing for cannabis. Esophageal injury by apple cider vinegar tablets has been reported, and, because vinegar products sold for medicinal purposes are neither regulated nor standardized, they vary widely in content, pH, and other respects. Long-term heavy vinegar ingestion has one recorded case of possibly causing hypokalemia, hyperreninemia, and osteoporosis. Diluted vinegar 3% to 5%, has also been tested as an effective screening tool for cervical cancer. Vinegar changes the color of affected tissue to white, making diagnosis by inspection possible, reducing by 35% the mortality for early detection against control group. Ibn Sina, in his famous book The Canon of Medicine, mentioned several beneficial medicinal uses for vinegar, claiming that it was a powerful clotting agent, healed burns and skin inflammations, and it relieved headaches caused by heat. He also considered vinegar a good digestive supplement. Ibn Qayyim Al-Jawziyya also mentions the merits of vinegar in his book, Al Tibb al Nabawi (The Prophetic Medicine). In this book, he claimed that wine vinegar helps against gastric inflammation and bile, and prevents the effects of toxic medications and poisonous mushrooms. The conductivity of many materials increases as an applied external electric field increases in strength. This is known as the "second Wien effect" and Lars Osanger investigated this effect using acetic acid solutions in 1934. Vinegar is an excellent solvent for cleaning epoxy resin and hardener, even after the epoxy has begun to harden. Malt vinegar sprinkled onto crumpled newspaper is a traditional, and still-popular, method of cleaning grease-smeared windows and mirrors in the UK. Vinegar can be used for polishing brass or bronze. Vinegar is widely known as an effective cleaner of stainless steel and glass. Vinegar has been reputed to have strong antibacterial properties. One test by Good Housekeeping's microbiologist found that 5% vinegar is 90% effective against mold and 99.9% effective against bacteria, while a study showed that vinegar is less effective than Clorox and Lysol against poliovirus. Vinegar is very good at removing cigarette smoke residue from windows and surfaces. It can be wiped on and left - after it dries, both vinegar and smoke smells are gone. Vinegar can also be used as a very effective rust remover from iron and steel components. Rusty components can be submerged for a few hours - or days if the vinegar is diluted. This is a very popular way of de-rusting sheet steel such as car body panels. Vinegar is effective in removing clogs from drains, polishing silver, copper and brass as well as ungluing sticker-type price tags. Vinegar can be used as an herbicide. Acetic acid is not absorbed into root systems; the vinegar will kill top growth, but perennial plants may reshoot. Most commercial vinegar solutions available to consumers for household use do not exceed 5%. Stronger solutions are available from some retailers, but it should be noted that solutions of 10% and above require careful handling, because they are corrosive and damaging to the skin. When a bottle of vinegar is opened, mother of vinegar may develop. It is considered harmless and can be removed by filtering. Vinegar eels (Turbatrix aceti), a form of nematode, may occur in some forms of vinegar unless the vinegar is kept covered. These feed on the mother of vinegar and can occur in naturally fermenting vinegar. Some countries prohibit the selling of vinegar over a certain percentage acidity. As an example, the government of Canada limits the acetic acid of vinegars to between 4.1% and 12.3%. Water-slide decal application as used on scale models, musical instruments, etc. One part white distilled vinegar (5% acidity) diluted with two parts of distilled/filtered water creates a suitable solution for the application of water-slide decals to hard surfaces. The solution is very similar to the commercial products, often described as "decal softener", sold by hobby shops. The slight acidity of the solution softens the decal and enhances its flexibility, permitting the decal to cling to contours more efficiently. When baking soda and vinegar are combined, the bicarbonate ion of the baking soda reacts to form carbonic acid, which decomposes into carbon dioxide and water. Commons has media related to Vinegar. Fernald, Frederik Atherton (January 1887) "